Jabra, once best known for their range of business audio accessories, has been branching out into the consumer audio space in recent years. Their ambition has never been more evident than at CES 2019, where they took to the floor to showcase their latest noise-canceling over-ear headphones, the Elite 85h. At first glance, it’s hard not to be impressed with the headphone’s design. Although the form is always the same, Jabra has made the Elite 85h stand out, not with loud colors, but with a subtle and elegant design. Even the outside of the earcups has been covered in wind-resistant colored fabric, rather than the more traditional metal or plastic finishes. They are available in Black, Titanium Black, Gold Beige, and Navy, with all colors making the headphones look understated but smart. The earcups themselves are shaped like ovals, rather than circles so that they remain comfortable to wear over long periods. The Elite 85h come equipped with Active Noise Cancellation (ANC) but are still able to deliver an incredible 32 hours of battery life with ANC enabled. If you forget to turn off your headphones, the Elite 85h have on-ear detection and will automatically power down when you aren’t wearing them. The noise cancellation is achieved using internal and external microphones on the headphone’s earcups. The external mics pick up the sound around you and cancel it out before it interrupts your listening. There are also microphones inside the earcups which will cancel the noises created inside, like the earpads rubbing against your skin. The level of detail the ANC can detect means that the Elite 85h has some of the best noise cancellation performance on the market. That would be impressive on its own, but Jabra have teamed up with audEERING, an AI audio technology company, to detect the noise environment and automatically switch the noise cancellation profiles accordingly. These profiles can be customized with the Jabra Sound+ app, with default profiles including commute, in public, and in private. Along with nearly every product showcased at CES this year, the Elite 85h come with support for smart voice assistants. Fortunately, Jabra hasn’t pinned all their hopes on just one ecosystem. The Elite 85h integrate with Google Assistant, Siri, and Alexa so no matter which of the mainstream smart assistants you use, you should be covered. The headphones are rain-resistant with IP52 dust and rain resistance, so a spot of rain shouldn’t ruin your day either. If you register for the free two-year Jabra warranty, all dust and rain damage will be covered for the duration too. As someone who has reviewed many headphones, including noise cancellation favorites like the Bose QC 35 II, the audio quality was something I was eager to test. Jabra had set up a closed booth for the Elite 85h demos at CES. Although this sounds like a way of controlling the environment to best showcase the headphone’s performance, they used the closed space to play pre-recorded background noise from a busy train, and London’s Victoria railway station. During the test, it was hard not to be overwhelmed by just how clear the audio sounded. The headphones were immensely comfortable to wear, and they felt light and unobtrusive. When the background noises were changed, the AI would recognize the new landscape within 15 seconds, and adjust to the new profile. This proved to be the case each time the environment changed. 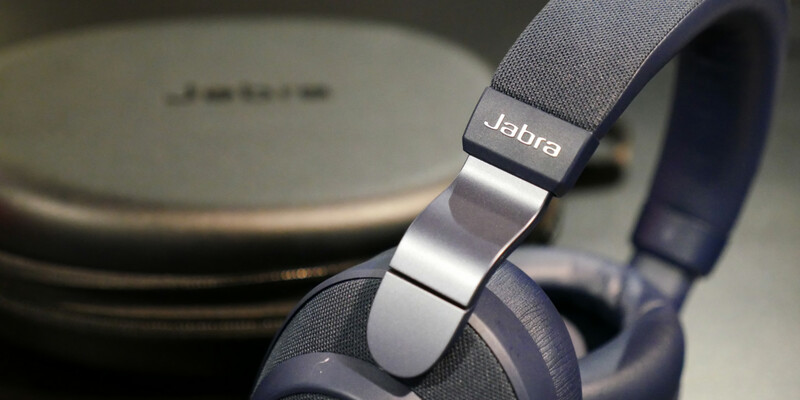 I didn’t attend CES expecting to be blown away by anything I saw, but with the Elite 85h, Jabra may have found a way to displace the Bose QC 35 at the top of my list. The headphones will be available from April 1st, 2019, priced at $ 299.